I help with this by providing many step by step tutorials. In the beginning, I only meant to sell the professional floral supply products that are usually only available to florists. It was frustrating, however, when I scanned the most popular wholesale flower sites to see that many required brides to purchase their needed flowers in large lots, often claiming that the retail price is an exorbitant amount. Really? Twenty gerbera daisies normally sell for $285.00? I'm sure most florists would love to charge this for 20 Gerberas, but find that a little hard to believe that someone would pay $14.25 for one single daisy. To add to the insult, the prices they claim to be wholesale are not always the prices that flower distributors pay. It is not really free shipping if the prices are so inflated. I decided to carry an assortment of fresh flowers in my own online store. All products are shipped from an active floral wholesaler who services a large area in Florida and beyond. I have worked with this family owned company for many years and appreciate that they work hard to satisfy each and every customer. Realize, however, that you are dealing with a live product that is subject to weather and shipping conditions. I don't claim to sell wholesale (I wouldn't stay long in business if I did!) - yet I try to offer flowers at a reasonable cost and keep my shipping costs fair. I do sell in single bunches and offer a wide variety of common greenery. Wholesale farms may charge inflated prices for greenery to discourage sales. Their interest is in moving their main flower crop, not in selling floral greens. It is wise to take advantage of my free Wedding Flower Calculator in order to figure exactly the amount of flowers you need, rather than purchase excessive bunches of single varieties. I always create a "flower recipe" for every design I plan to make and use it as a guide when creating the wedding florals. In doing this, you will know exactly how many flowers you need for everything and not run short. I don't stop with the flowers - I provide free tutorials and teach the DIY bride exactly how to process her wedding flowers correctly. If she is going to invest a lot of money in flowers, it is wise to spend a little more and treat them the same way a professional florist would by using re-hydrating products and fresh flower food. This is the life of your flowers and shouldn't be skipped if you want them to last. 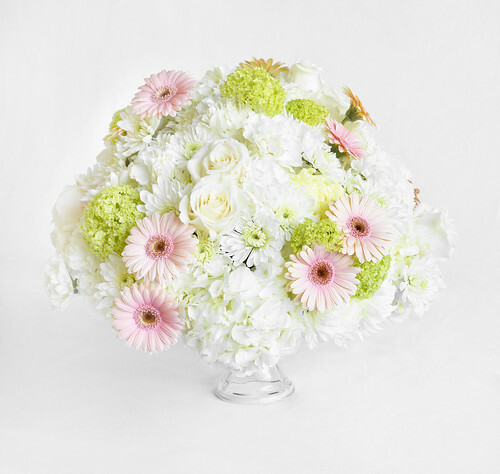 Gerbera daisies are a wonderful wedding flower and available year round in a large assortment of colors. Please note that this is an extremely water loving flower and should be designed so it has a constant water source. They need to be cut underwater immediately upon arrival and given a long drink. Do not immerse the whole stem in water, rather the cut ends, ensuring that they do not go dry at any time. Soaking the entire stem can make them soft and rather slimy after a day or two. I don't usually recommend Gerberas for cut flower work such as boutonnieres or corsages. They may grow limp quickly without a water source. Photo courtesy via Flickr. Please click for more info.